Level-headed and altruistic, perhaps to keep his innate rage in check. His forced leadership role has certainly helped in that regard, having since developed a strong set of convictions and ideals over the years. The combined traits, while sometimes at odds with eachother, result in a stubborn personality to say the least. He will not concede to new or radical ideals very easily, but will usually respect those that hold them; provided they don't infringe on his own. Asgrim's abilities had manifested early in the form of heightened physique, recovery, and boundless stamina. As is often the case, his abilities branched out, fostering the beginnings of genetic memory in the form of flashbacks or dreams, leading to his acquiring an affinity for heavy combat and, much later, rune magic. The exact details as to his ancestral origins, by name or otherwise, have not yet been disclosed. He eventually hooked up with Rising Force after the usual exploratory, brooding, solo act that we all know and love ran its course. And, despite the occasional split from the group to embark on his own initiatives, he would eventually reclaim his spot among the leadership. Armor and Weapons Apparently summoned as a form of construct, a detailed analysis would suggest the resulting materials are inferior to those of present day. Depending on the extent of his Rage, however, little difference can be discerned when actually employed in battle. Runic Magic While not an expert, Kveldulf has acquired some use of this form of magic after many exploratory endeavors to unlock ancestral memory. It sees little use while he's in the grips of Rage, unless such a gnostic state is necessary to a given rite. Berserker Rage Any length of battle will see an equally progressed state of contained rage, put to purpose. Faster, stronger, more accurate attacks, while shrugging off the opposition. The height of this ability is as yet unexplored. Genetic Memory Given context or reasonable preparation, Aiden can assimilate the memories and experiences of his previous ancestors, affording him generations of knowledge, most particular in that of combat. Interestingly, there's a generation gap starting around the 1930s and going forward where no such memories may be obtained. Isa Represents authority and masculinity, a symbol of power. In this case, a huge warhammer. Redundant invokation of this rune summons varied frost effects, largely defensive in use. 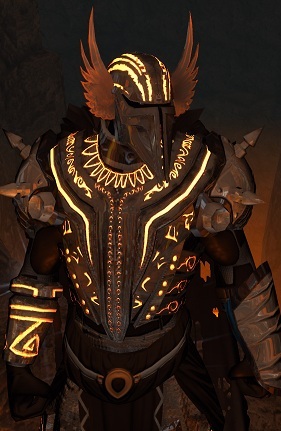 Teiwaz, Algiz Conjures a set of heavy armor, the majority etched in glowing runes. This set affords superb defensive benefits, with some trade off in the offense department. Still, quite a powerhouse. Recovery from damage is pushed well above his usual average, though requires concentrated channeling of the etched runes; in the end, it bleeds off Rage that would otherwise fuels his attacks. Eihwaz, Mannaz Used in varied combination, replaces much of his armor with the bare minimum, and is often used in conjunction with his Rage. Though more susceptable to damage, his physical strength is pushed through the roof. Restraint might become an issue. Depending on the context, his weapon may also be replaced by an, again, oversized greatsword (Might be tied with the Othala rune, indicating inherited property). Hagalaz A weapon rune, invoked physically on the surface of whatever weapon is being wielded in order to achieve secondary effects. For example, invoking Isa then Hagalaz could result in hammer strikes spreading frost or scattering shards of ice on impact. Thurisaz Supplementary rune, bolstering the strength of attacks; possibly used in conjunction with other runes, as aforementioned. Sowilo, Berkana Healing runes, most often pertaining to himself. By no stretch is he a talented healer where others are concerned. This page was last modified on 25 September 2013, at 17:07.